Camping will be a breeze for your larger family in this Tracer Breeze two bedroom model 31BHD travel trailer. 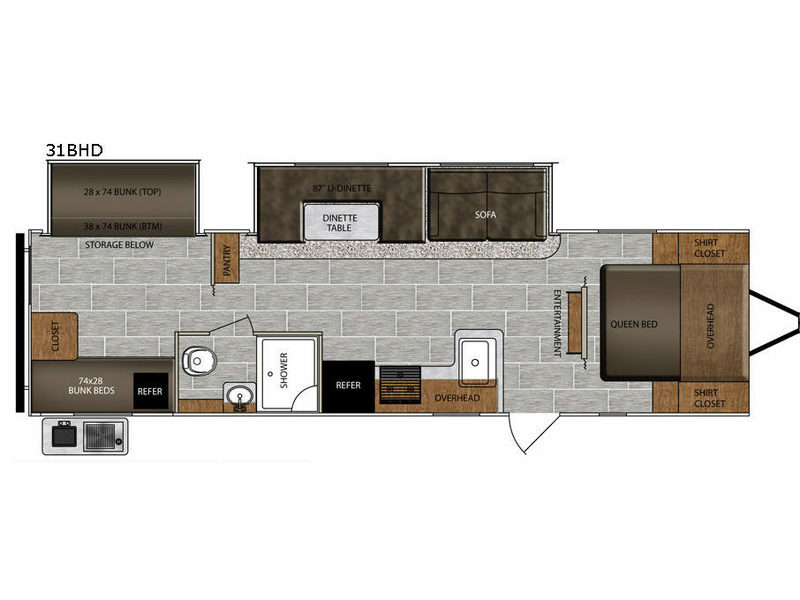 There is a bunkhouse featuring one nice slide for added interior space that the kids will enjoy, plus four bunks of various sizes and a closet for them to keep their personal items close. In the living area, there is room for the whole gang to gather comfortably for meals, games, or watching TV at the 87" U-shaped dinette and sofa slide out. The large frameless windows let in lots of natural lighting, plus provide a beautiful view of your surroundings bringing the outdoors inside. This unit even features an outdoor kitchen so you can spend as much time enjoying fresh air while you cook. The inside kitchen amenities make it easy to prepare healthy meals just like at home too. Take a look today!